There is an ancient art of healthcare that was developed thousands of years ago in China, one that is known today as acupuncture. It is based upon the understanding that there is an energy flow throughout the body, and its proper flow can affect your health. If there are disruptions, this can lead to disease occurring, and the flow can be restored by affecting the energy by inserting needles at what are called meridian points. There are specific areas of the body where the meridian points can be found, and once proper flow is established, a person can resolve certain issues that they are facing. This article will address how acupuncture can be used to help with migraines and headaches, a simple solution that will allow you to avoid costly treatments and pharmaceutical remedies. The body is capable of healing itself, and acupuncture can help accelerate this process. By stimulating meridian points, or what are called acupoints, sterile needles are inserted into the skin in order to affect a change. Additionally, for those that are not fond of needles, acupressure can also be used. As long as the physical body is affected in this way, releasing any blockages of energy, proper health can be restored. 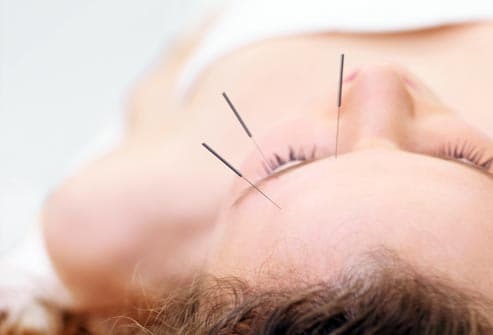 Prior to inserting needles, the acupuncturist will ask you about your overall health history. They will look at the shape of your tongue, it’s coloring, and feel your pulse prior to beginning. The acupoints that are targeted must be determined by the acupuncturist as they are not the same on all people. Once the needles are inserted, they may remain for up to 30 minutes until balance is restored. Acupuncture can be used to treat a wide range of ailments including neck pain, lower back pain, and even depression. If you have had a stroke, or even if you are feeling nauseous, this type of treatment can produce positive results. Underlying all of our physical ailments and conditions is an imbalance of this natural energy flowing through our body. Once the acupuncturist is able to balance this out, you should feel much better, a process that works very nicely for migraines and headaches. It may take more than one treatment as headaches tend to be the result of a great deal of stress. The energy in your body could have multiple blockages, and it could take a couple treatments to resolve these issues. In the same way that you cannot take an antibiotic one day, and expect your infection to be gone, the same is true for acupuncture and its ability to produce results which may take a little bit of time. Some people have reported that there are side effects that are experienced, one of which is viral hepatitis. This can affect the liver, yet most of these problems are related to an acupuncturist that is not using sanitary needles. The FDA, who once considered acupuncture as an experimental medical procedure now regulates all acupuncture needles that are used, just like scalpels and syringes. This is an actual treatment that requires tools that can affect the human body, so make sure that your acupuncturist is fully certified and is using only sanitary needles. Once you have had a treatment or two, you should notice a definite difference in the way that you feel. The ability to manipulate the energy of the body using acupuncture is so different from Western medicine which approaches the symptoms, not the underlying causative factors. Once your energy is back to normal, you will also notice many other benefits such as additional problems that you have had getting better over time. If you are having problems with headaches and migraines, you should certainly set an appointment with a certified acupuncturist that can help you resolve this issue. My symptoms coming into the office were pain, numbness, tingling, muscle spasms and sinus headaches EVERY DAY! Seasonal and postpartum depression were also big issues that I was dealing with when I arrived. I felt better immediately. I had more energy, better moods, and no headaches – all after only 2 treatments. My symptoms from the herniated discs also dissipated. I was able to stop Rhinocort for my sinuses, Prozac for depression and Advil for muscle spasms. I felt 100% better quickly. Although I did not come for the sinus headaches, Dr. Tad took care of them quickly and I think that made the biggest difference in the overall quality of life. I felt that they were something that I had to live with but thanks to acupuncture that is not the case any longer. Being off of Prozac is an added bonus. After dealing with postpartum/seasonal depression for 14 plus years, I am pleased to have other options for treatment that do not have the side effects that Prozac did. I actually felt good enough to go back to work! Thank you for giving my teenage son his life back! In every crisis, there is an opportunity. It took a crisis to get us to your office, now we don’t miss the opportunity to help others by referring them to you. Thomas suffered from debilitating headaches for over a year. Under treatment by an excellent neurologist, he tried biofeedback and one medication after another with limited success. He had almost constant headaches, and would often retreat to bed with a migraine. In June, he took a sudden turn for the worse. He was constant pain, confused, and only able to stay awake for a limited time. A lumbar puncture (spinal tap) revealed pressure on his brain due to an excess of cerebral-spinal fluid. This began the summer of even more medication, awful side-effects, frustration and despair. In September, I brought him to your office for the first time. The effects of treatment were dramatic. Within only several months, he is headache free and off all his medication. He is back on the basketball court and back enjoying his life. It is unfortunate that in our culture we view acupuncture as a treatment of last resort. We seek it, not out of knowledge, but out of despair. Acupuncture is a powerful tool to help the body heal itself. We need to view acupuncture not as an “alternative” medicine, but as smart medicine. But even the best techniques are only useful in skilled hands. I am so very grateful to Dr. Tad Sztykowski and Dr. Jon Hagenburg and to the caring and efficient staff who are an integral part of the treatment experience.